High light output from the NEW 4 W LED: Through the use of extremely high output 4 W LEDs, this lamp is much brighter compared to similarily sized halogen lamps, and has a longer burntime. These premium LEDs are selected by the manufacturer to have a light output from 67.2 to 87.2 Lumens for the same power input. These LED emitters are considerably brighter than the standard LED emitter and share the same burntimes. Since these premium LEDs are not always available from the manufacturer, and quantities are very limited, Selected LED lamps are not always available for sale. 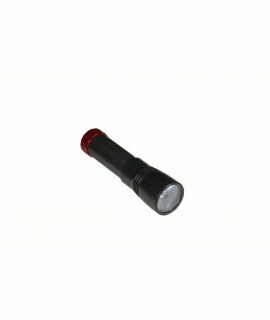 The focusing of the LED beam is tight enough to meet the needs of cave divers. 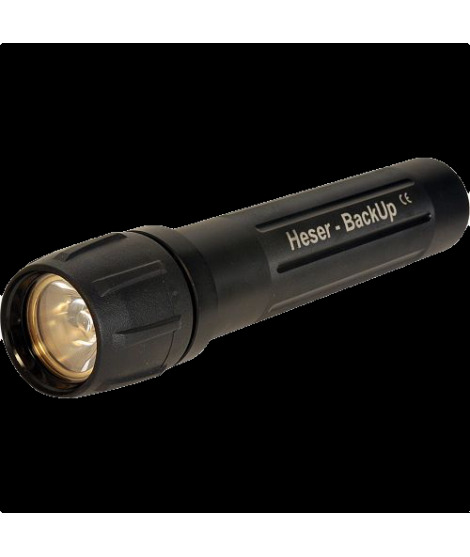 Until now, no LED lamp on the market had a tight enough focus for cavediving use. 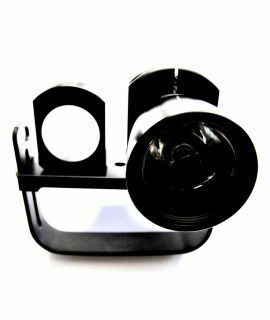 This focusing was achieved through a specially manufactured reflector. Until now it was normal for 50% of the available light not to be focused by the reflector/lens combination. This unfocused light spreads out to the sides and doesn’t do the cavediver any good. 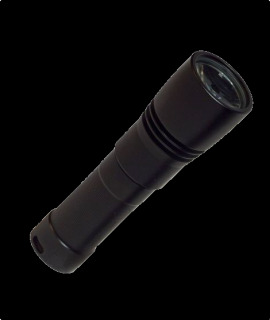 A tightly focused efficient light beam is also advantageous for normal openwater diving. High light output from the 4 W LED Through the use of extremely high output 4 W LEDs, this lamp is much brighter compared to similarily sized halogen lamps, and has a longer burntime. We provide 2 types of LED emitters: Standard Our standard LED emitter has a light output from 60.0 to 67.2 Lumens. Selected LED These premium LEDs are selected by the manufacturer to have a light output from about 240 Lumens for the same power input. 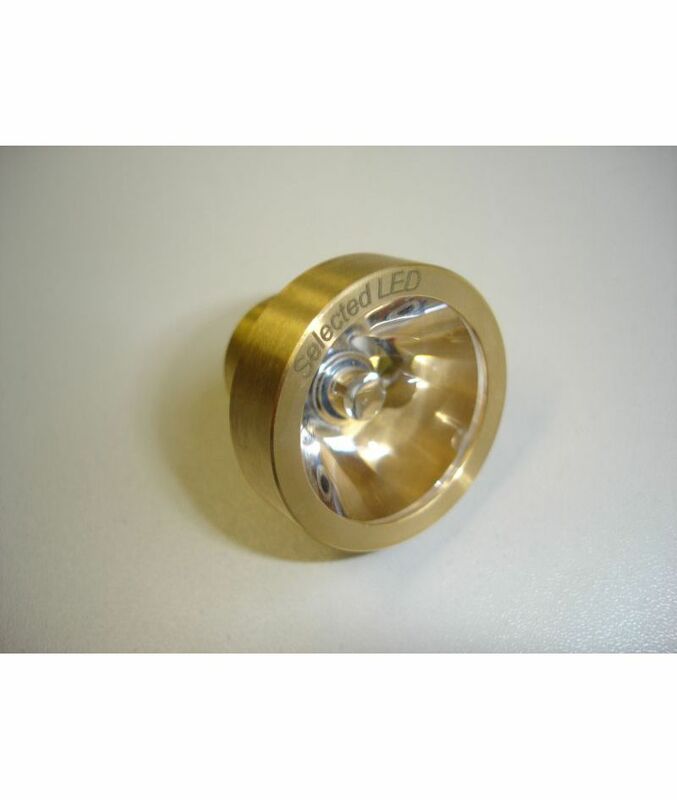 These LED emitters are considerably brighter than the standard LED emitter and share the same burntimes. Since these premium LEDs are not always available from the manufacturer, and quantities are very limited, Selected LED lamps are not always available for sale. Properly focused beam The focusing of the LED beam is tight enough to meet the needs of cave divers. 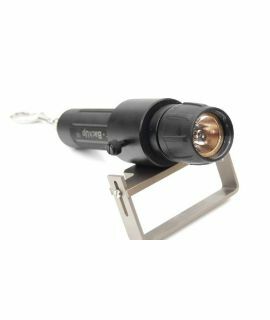 Until now, no LED lamp on the market had a tight enough focus for cavediving use. This focusing was achieved through a specially manufactured reflector. Until now it was normal for 50% of the available light not to be focused by the reflector/lens combination. This unfocused light spreads out to the sides and doesn’t do the cavediver any good. 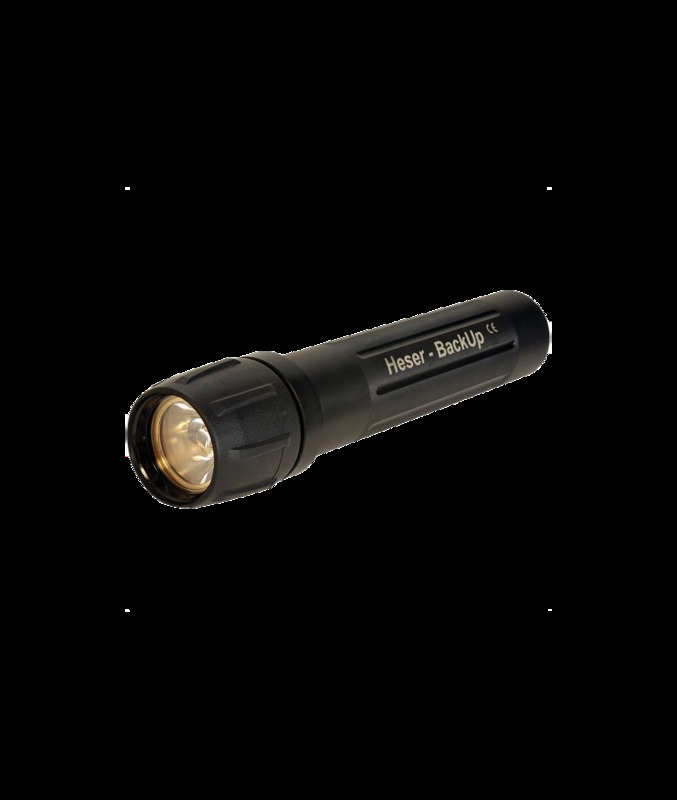 A tightly focused efficient light beam is also advantageous for normal openwater diving. A large reflector can more efficiently focus the LEDs output than a small reflector. Many LED lamp manufacturers use a smaller, less efficient reflector/lens unit, thereby saving money. We don’t. Since LEDs are shockresistant, and the LED junction emits light almost forever (over 50,000 hours) these lamps are highly reliable. Increased Reliability - Electronics can get damaged by water or shock, and become unusable. Increased Burntime - An electrically controlled LED is always using the maximum power that the circuit is designed for. The advantage is constant brightness until the batteries are completely discharged. The battery voltage drops during the discharge cycle, and the control electronics will compensate this drop by increasing current to the LED. Towards the end of the battery discharge cycle the current draw is at the highest level and the batteries rapidly die with little to no warning. Without control electronics the current draw drops along with the battery voltage. The disadvantage is the LED becomes dimmer as the voltage drops. The advantage is the burntime increases dramatically. 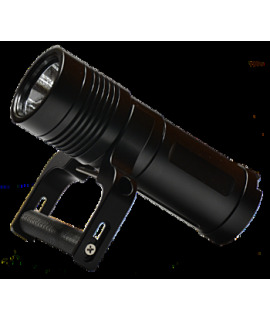 This can be an enormous advantage for a diver who needs light since the burntime provided by the electronics is no longer working against him. Due to the elimination of control electronics the lamp is capable of delivering enough light for over 8 hours. Due to the use of an LED and the elimination of electronic controls, the lamp is capable of providing sufficient light for 6 to 8 hours (depending on the type of batteries you select). Only 2 parts are in contact with the water, and there is only one seal The lamp has only 2 outside parts that are in contact with the water, and there is only one opening to seal. Each additional opening just adds an additional failure point. The only opening is sealed with 2 O-Rings, one behind the other. This reduces the possibility of a seal failure which can be caused by sediment deposited on the outside O-Ring. If the outside O-Ring seal leaks, the inner O-Ring will still be sealing the opening. All internal parts are precision machined. No cheap metal stampings are used. The Reflector is made from a solid piece of brass. 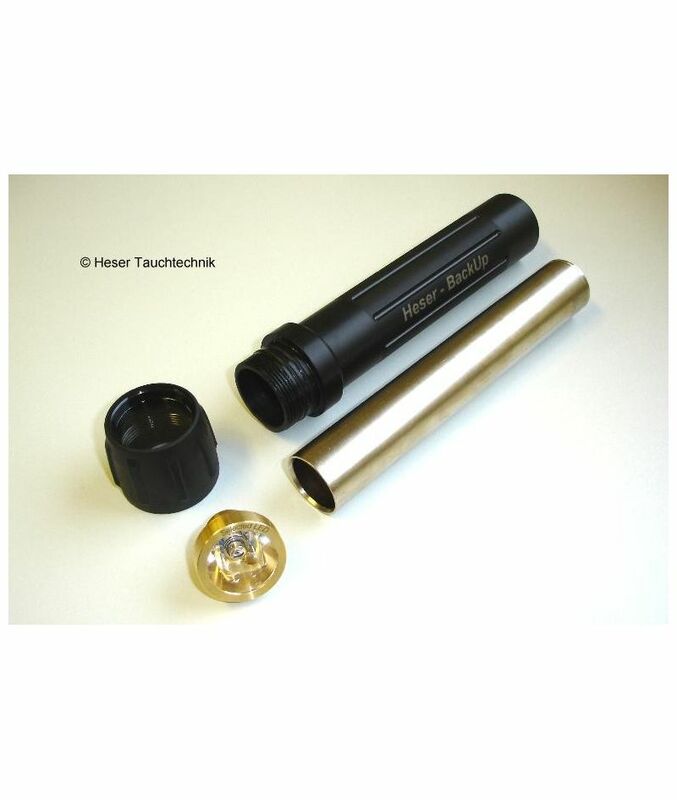 The battery tube is made from an Aluminum tube with 2mm wall thickness and is nickel plated. The Bottom of the battery tube is made from a solid piece of stainless steel. The contact spring is also stainless steel. The lampbody is turned from a solid rod. The axial channels and roughened middle section make the lamp easy to hold with wet hands and gloves. The rubber hood on the lamphead is also nonslip. The lamp can be used with 3 Alkaline „C“ Cells or with 3 NiMH Rechargable batteries. (If you use NiMH batteries, you should ask the battey manufacturer if a hydrogen catalyser is required. Use if NiMH batteries is, of course, at your own risk.) Due to the extremely long burntime compared to normal lamps, one set of alkaline batteries will probably last for a whole vacation’s nightdives. Therefore you don’t need to provide the care needed to properly maintain a set of rechargeable batteries. Wahnsinn... Super Top Service mit Auszeichnung! Und die Lampe ist der Burner schlechthin! Ich habe zwei Haser BackUp Lampen gekauft und tauche sie in der GUE/DIR Konfiguration mit einem Halcyon Harness als reine Backuplampen. Die Lampen sind ihren Preis wert! Hervorragende Verarbeitung, einfache und zuverlässige Technik. Das sehr weiße Licht und der exakte Fokus ermöglichen eine gute Kommunikation auch bei schlechten Sichtverhältnissen und gewährleisten eine hohe Sicherheit wenn es darauf ankommt. 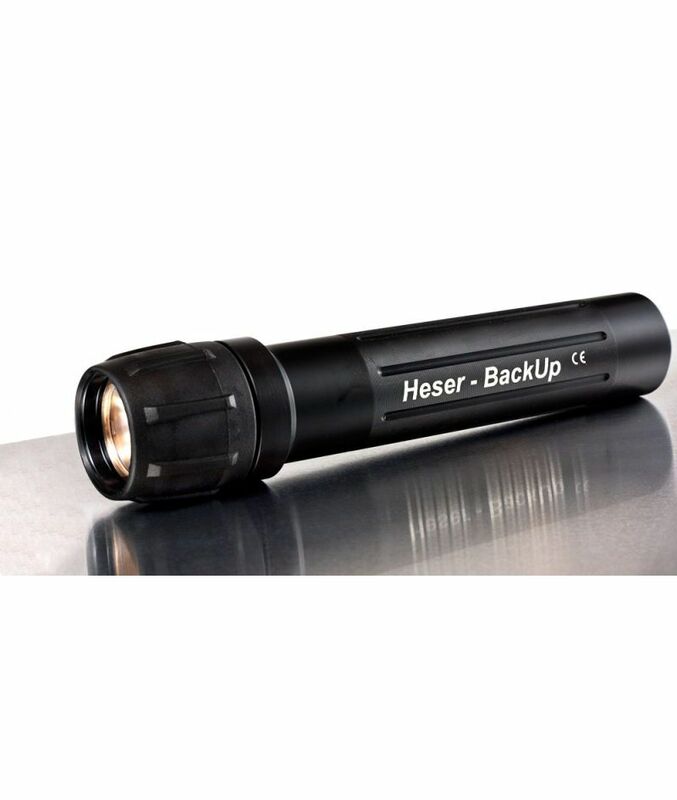 Besonders als Backup für GUE/DIR Taucher ist die Heser BackUp LED meines Erachtens die beste Lampe am Markt. Ich habe vor einiger Zeit diese Lampe gekauft und den Kauf noch kein Stück bereut. Hatte sie in Ägypten als Hauptlampe mit dabei und sie leistete wirklich gute Dienste. Ich habe auch festgestellt, dass sie, selbst nachdem ich sie versehentlich geflutet habe (im Salzwasser!! ), nach dem Wechseln der Batterien wieder tadellos funktioniert! Ein wirklich super zuverlässiges und robustes Teil, nicht nur als Backup! Sehr solide gearbeitet mit sauber fokussiertem Spot. Sehr weisses Licht, welches Dank des Fokus eine gute Kommunikation auch unter schlechten Bedingungen erlaubt.